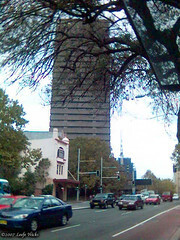 The UTS tower building seen through the leafless autumn branches of a tree from a bus stop across the road. This entry was posted in Photos, Uni and tagged Autumn, photo, tower building, UTS. Bookmark the permalink.